Announcement Welcome to the Party Favor Candy Shop! 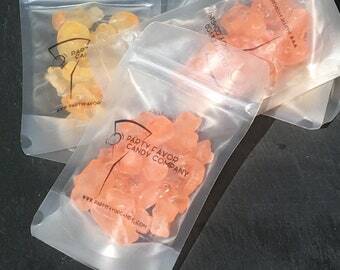 Party Favor Candy Co. is a new, unique candy that brings a delicate, intricate taste of various alcoholic beverages from around the world in delicious gummy form. These gummy’s were designed for party planners involved with wedding's and special events to use for goodie bags and party favors. When your guests leave your events this product will help your guest remember your event! We now offer free local pick up in Chicagoland area, with a purchase of $20 or more now local area people. Please message me beforehand for a coupon code. Welcome to the Party Favor Candy Shop! CUSTOM LISTING! This is a Private Listing. Cranberry Apple Vodka Infused Gummy Candy 4 oz. Previous issue was resolved thank you Margo. Valentines Strawberry Wine Champagne (With Real Strawberry Pieces!) Cocktail Infused Gummy Candy 4oz. Very upset !!!! Sent this item to best friend as a birthday gift and was told they tasted like pure lemon mixed with chemicals. Not only that but ordered two different kinds and was sent a duplicate of the same batch. Not only that but placed my order on the 15th it didn't arrive until the 23rd. I politely asked Margo the owner who was responsive in the beginning if she would kindly redo my order and was told yes. She even allowed me to change what I wanted as she messed up the first order. I have yet to receive anything and she has since stopped responding. I tried to open a case but considering that the items were received etsy clearly wants no parts at least you could have just issued me even a partial refund if redoing my order WHICH YOU ALLOWED was too much. Very upset and will never purchase from here again. Hi Mia. Your order is on the way. Chicago was hit with 2 snow storms back to back so it could have been delayed. It should have been there by now. I can see if there is a tracking number and I’ll send it to you in a private message. I’m a solo worker behind this ship. I’m sorry I missed your last message. I have been overwhelmed by orders and I happened to miss replying to your last message. Valentines Day is around the corner. You don’t want to be the person that gives the same ol’ thing every year:::right? Don't know what to get for your pops? Or your father in law? Or that friend that is about to be a father? Or is a first time father....these Drunken Lime Margarita gummy bears are a great Father's Day gift! Mimosa gummy's made in the commercial kitchen. First day in the commercial kitchen making Green Apple Martini's with Grey Goose Vodka. I started testing out flavors, spending countless hours researching different methods of candy making and discovered many of the various candies that are currently available. I realized that there were a lot of the same things in different places. I just knew that I had dawned on something new and never done before. Party Favor Candy Co. is the future of candy. This fun journey into candy making has brought out a beloved passion. I have visited many candy stores and tasted many different cocktails and concoctions on my travels. I am so excited to share with you the various flavors and drinks that I have discovered from around the world and bring them to you in delicious gummy forms for everyone to enjoy, have fun and to make great memories with! I am constantly looking for new foods, liquors and especially CANDY! I mostly love exploring this world of ours and meeting new people and discovering new flavors. Please share if there is something you think I should try! Candies can be personalized with favorite flavors, colors and be labeled with logos, dates or names. Please let me know of any customizations before purchase. Candies don't need to be refrigerated. Just keep them in a cool place. Unopened the candies last over 6 months. Opened the candy can last up to a week and a half if they make it that long! Gummy bears do need to have a cold pack while traveling in hot weather otherwise, you'll end up with candy soup! Wholesale options are available. Please contact me for details. Need time in advance depending on shipment. Where are the candies made? How much alcohol is in them? I use a rented out commercial kitchen that is smoke and pet free. There is plenty of alcohol that goes in, but with cooking procedures, the alcohol cooks out and leaves a standard 6 oz. bag to equal about 5% abv which is similar to having a beer. Yes, all candies are gluten-free. The owner of the kitchen uses it with gluten foods and may cross-contaminate. Please let me know of any allergies. How many gummies come in a bag? There are roughly about 40-55 pieces in a 4 oz bag and 60-75 pieces in the 6 oz. bag. -1 lb. of candies is $32 - please reach out to me if interested in getting larger quantities like a pound or more. Above 1 lb. needs to be discussed prior to purchase, please feel free to contact me with any questions! We have very sleek packaging with a clear but frosted type poly bag that has a ziplock seal and is heat sealed for guaranteed freshness! I have been certified with a food handling certification license in the state of IL and are all made under my care. Candies are insured.